Saint Roque Gonzalez de Santa Cruz was born on November 17, 1576 in the city of Asunción, now the capital of Paraguay, South America. The son of wealthy Spanish colonists, he was well-educated and a devout Catholic. He was ordained a priest at age 22. 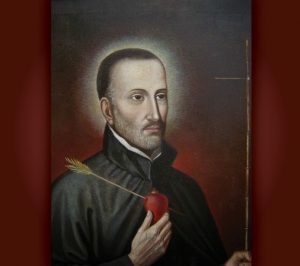 In 1609, attracted to the evangelizing activities of the Jesuits, Father Roque entered the order and began his own evangelizing ministry as a missionary in a vast region of South America where today the countries of Brazil, Argentina and Paraguay intersect. He would spend the next two decades searching for indigenous peoples, gaining their trust and showing them how to improve their lives by settling them into organized communities protected from slave traders. He then converted them to Christianity. The written records of his extraordinary accomplishments as a missionary and explorer still exist. At a time when Spanish conquistadors were brutalizing and enslaving natives, Father Roque helped them become self-sufficient and free. In 1613 he established his first native settlement, and spearheaded the Jesuit-movement to establish what came to be called “reductions,” independent Indian village communities that were off limits to slave traders. The economy of these villages made the Indians self-supporting by combining communal agriculture with private property holding. And the villages had their own political structure that gave the natives a measure of freedom. Father Roque was an innovator who created the model for these unique communities. The Paraguayan missions reached the highest degree of civilization to which it is possible to lead a young people. In those missions, law was respected, morals were pure, a happy brotherliness bound men together, the useful arts and even some of the more graceful sciences flourished, and there was abundance everywhere. Not everyone embraced his model of evangelizing though. In 1628, Father Roque, joined by two other Jesuits who would later become saints themselves, Saint Juan del Castillo, SJ and Saint Alonso Rodríguez, SJ, established a mission that roused the hostility of a local chieftain. In November 1628, Father Roque and his Jesuit companions were tortured and killed. “All the Christians among my countrymen loved the Father and grieved for his death because he was the father of all our Indian communities along the Paraná River” so testified Chief Guarecupi after Father Roque’s assassination. The chief’s testimony revealed a deep affection by the indigenous people for Father Roque and their awareness of the great personal sacrifices he had made over two decades to improve their lives and bring them to Christ. Father Roque was canonized by Saint John Paul II in 1988. His feast day is November 17.